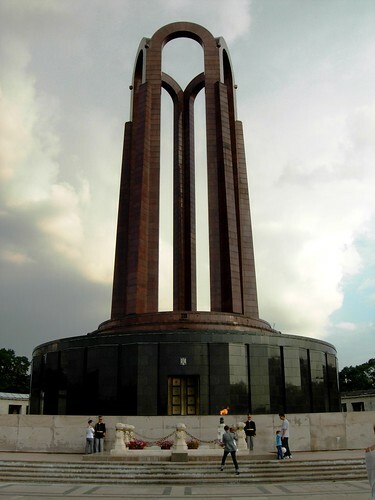 "The Carol Park Mausoleum (Mausoleul din Parcul Carol), known during the Communist régime as the "Monument of the Heroes for the Freedom of the People and of the Motherland, for Socialism" (Monumentul eroilor luptei pentru libertatea poporului şi a patriei, pentru socialism), is located on a plateau. Formerly, it was the site of the Arts Palace (Palatul Artelor) and later of the Military Museum (Muzeul Militar), with the fountain in front of the latter museum. The mausoleum was built in honour of revolutionary socialist militants. Designed by architects Horia Maicu and Nicolae Cucu, it was inaugurated on December 30, 1963, the 16th anniversary of the Romanian People's Republic. The base is circular and plated with black granite. Above rise five narrow arches covered with red granite. Inside the base there is a rotunda covered in red granite plates; the ceiling is decorated with a golden mosaic. Prior to the Romanian Revolution of 1989, the rotunda contained the crypts of Communist leaders Petru Groza, Gheorghe Gheorghiu-Dej and Constantin Ion Parhon. In the semicircle around the monument were crypts containing the remains of a number of socialist militants, such as Ştefan Gheorghiu (trade unionist), Ion C. Frimu, Leontin Sălăjan, Alexandru Moghioroş, Lucreţiu Pătrăşcanu (after his rehabilitation), Grigore Preoteasa, Ilie Pintilie and Constantin Dobrogeanu-Gherea. To the right of the monument was a hemicycle containing the funeral urns of Communist militants, including Gheorghe Vasilescu-Vasia, Constantin David, Ada Marinescu, Panait Muşoiu, Barbu Lăzăreanu, Simion Stoilow and Mihail Macavei. When it was built, an eternal flame burned on an upper terrace near the monument, in a granite amphora. This was intended to preserve the memory of those who had fought on behalf of the working class. In 1991, the mausoleum acquired a new purpose when the Communists were exhumed and interred in other cemeteries. They were replaced by the remains of soldiers fallen in World War I, brought from the Mărăşeşti Mausoleum. The mausoleum and the monument in front of it were dedicated to the Unknown Soldier. The rotunda remains closed to the public, and guards are stationed to prevent the approach of visitors.